Nitrocellulose glue with very flamable residue. Use to assemble any type of combustible envelope cartridges. Superb adhesive power on lead and H&C paper. Dries very quickly. Creates a protective film. Allows to fix teared paper. Used as coating, protects from bad weather. Does not let any residu into the chambers. Its dry residue is as flamable as the H&C paper. Papier hyper combustible H&C grand format . Roughly 80g/m². Size about 21x50 cm. 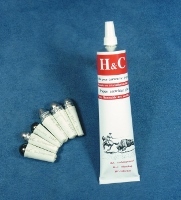 Does not leave any residue into the chamber when used with the H&C glue. For many handgun or long gun calibers. Cut the size you need to meet your needs. Outside EU (ex: Canada, USA...), the paper with be delivered dampened. Allow to air dry before use.